Anyway, I thought I'd share a tasty tidbit I enjoyed recently. 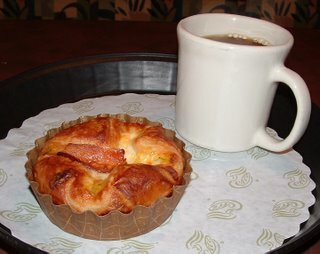 Panera Bread, which has popped up all over Rochester, serves what they call Baked Egg Souffles in the morning. I ordered the Spinach and Bacon Souffle. While I wouldn't really call it a souffle -- the filling more like a quiche -- it was delicious. The filling was flavorful and creamy and the crust was like a flaky croissant. To be honest, I haven't been all that thrilled with Panera Bread's breads. I couldn't put my finger on the problem, but a friend summed it up. They overbake their breads. Everything is dry and tastes like it has been baked a little too long. One of my kids ordered a bubble bun, and we ended up throwing it away. Another day I split a pecan sticky bun with one of my kids, and it took 20 seconds in the microwave to get the texture I'd expect from a sticky bun. So if you go to Panera Bread for breakfast, stick to the yummy Baked Egg Souffles. I'm curious to know whether anyone else shares our perception that Panera Bread overbakes their breads. If you have an opinion, leave a comment! Actually Panera has always bothered me but I couldn't quite put my finger on why until I read this. I feel exactly the same way. It all looks like it should be so yummy, but it is usually dry and disappointing. Cookies and cakes are usually okay, but breads aren't all that great. Thanks for commenting! It's good to hear that Diane and I aren't imagining things. I totally agree with you on both points... their breads are dry and overcooked... and their souffles are awesome!! If it wasn't for the 34 grams of fat each, I would love to eat one everyday!!! Yes, you're so right! It all looks beautiful but doesn't deliver on taste and quality. My worst Panera experience was ordering a vegetarian corn chowder and finding chunks of chicken along with rice in the soup. When we brought it back the server acknowledged that she'd given us the wrong soup. Her excuse was "they all look alike." Panera never responded to my e-mail complaint.